Have you always dreamed of a pristine, white Christmas? Most of you would answer yes, we know. The imagery of a snowman decked in a fleecy neckwear or reindeer with a bright colored nose always wander in our mind. Are you looking for places where you can experience white Christmas? Then our post is here to help you! If you reside in the southern hemisphere, the cold must be already taking better of you. And if you are an Asian, then a white Christmas is a distant dream. To witness the beautiful white Christmas, you have to head to the north. Here are top ten places where you can experience a white Christmas. When it comes to White Christmas, Montreal in Canada is not going to disappoint you. The city is always prepared for the snow season, so you can be sure to witness thick layers of white flakes during Christmas. It has pristine, calm and cold days, just as you see in the postcards. The 18th-century French buildings look fabulous covered in a thick blanket of snow. In fact, Montreal gets nearly 20 inches of snow every December. And then there are the impressive Christmas lights on the Mont-Royal Avenue. The city holds annual Santa Claus Parade featuring 15 floats, including the appearance of Santa Clause. If you want to see spectacular fireworks, then you must visit TELUS Fire on Ice held at the Old Port. Chicago is one of the magical towns to visit during Christmas. It completely transforms during Christmas. The Christkindlmarket, a German vendor market will give you a taste of the exotic. It also sells Gluhwein that will keep you warm during the chilly season. Chicago has more than 50% chance of snowfall during Christmas, which we think is not a bad success rate. Just keep your finger crossed! Prague is one of the most popular cities of Europe. It has a distinct mix of architecture and influence. Hitler spared the city because he thought it was too beautiful to destroy. Prague has everything that you would expect from an iconic European city. It has historic bridges, picturesque river, exotic cuisine, ancient monuments and an imposing castle. It feels that Prague was made for Christmas only. Christmas does not wait around in Prague. It kicks off as early as October when you can see beautiful Christmas ornaments adorning the windows. By the end of November, the trees are covered with colorful decorations and light. The annual Christmas markets in Wenceslas Square and Old Town Square are must visit. You can enjoy delectable treats, rides, trinket stalls and eclectic crowds here. The snowfall makes the city all the more beautiful. Yes, the chance of snow on Christmas day is not very bright, but there’s a risk nonetheless. Helsinki, the capital of Finland, is one of the few places one where snow is most likely to arrive in late December. It has an eclectic mix of cosmopolitan architecture and design, which means the perfect choice for a winter getaway. Helsinki provides many activities to indulge during Christmas. Just find a cozy place to stay and watch everything run despite half a meter of snow outside. If you feel too cold, then warm up with Glogg while watching the reindeers. If the snow is not expected in Helsinki, then you can hop on a domestic flight elsewhere in Finland for some guaranteed magic of a white Christmas. Austria is not as famous as France or Switzerland, but Austria is slowly catching up now, primarily because of its reputed slopes and a discounted price. 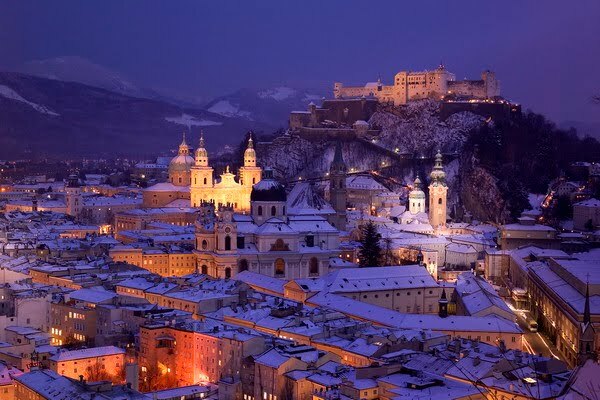 Salzburg is a magical and picturesque town that transforms into a winter wonderland during Christmas. On Christmas morning, you can choose between skiing in the Alps, skating on the Weissensee and a sleigh ride. If possible, try to attend one of the piano concerts here. And ride on the horse carriage too. The place is so charming and quaint that you will be needed to drag by your heel when leaving. If you are brave enough to experience hard and cold winter, then you can head to St Petersburg, Russia. It snows in Russia from November to March, so you are sure to witness white Christmas here. St. Petersburg has a kind of Christmas charm, spirit or history that you are unlikely to experience anywhere else. Make sure to indulge in Russian vodka and visit the Winter Palace, take a stroll along the frozen River Neva and see the huge Christmas Tree in the Palace Square. 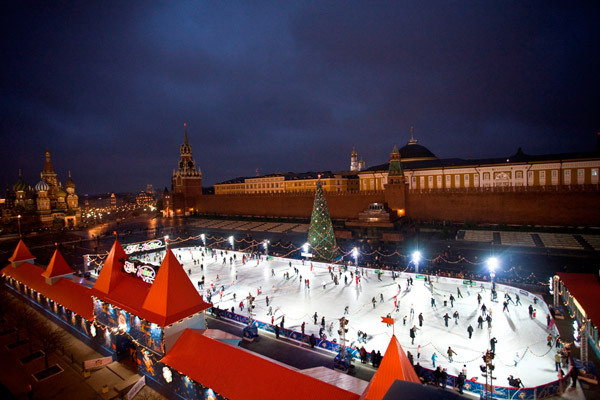 If possible, head to Moscow to the involved in the Russian Winter Festival from mid-December to mid- January. Edinburgh celebrates Christmas like just a few countries in the world. Just in the city’s center stands the spectacular Christmas market, complete with ice skating rink, Ferris wheel, stalls selling mulled wine and carnival games. If you’re lucky, you can also get up, close and personal with a reindeer. A wide range of spectacular shows and Christmas parties are held throughout the Christmas season. It includes live performances, family-friendly performances, and late night dancing. The night light is truly spectacular, and the sky fireworks are dazzling. If you plan to stick around, you can also see the Edinburgh’s Hogmanay festival. Norway is another great place to witness white Christmas. Christmas in Norway, Tromso can be memorable for a variety of reasons. Tromso is one of the best regions to see the Northern Lightning. The lights appear just like a real painting here. Tromso has a charming, picturesque setting and an old-world atmosphere. The classic Norwegian wooden houses flaked in snow look truly spectacular. You can spend time exploring the city on foot or via dog sled. Also, Tromso shuts down from December 24 to 26. So there’s no one who can disturb you from spending quality time with your friends and family. Vail is one of the exceptional destinations to celebrate White Christmas. Here, you can be assured to find snow. Vail houses one of the largest ski resorts in North America. It turns more like a fairytale during the Christmas, with brightly lit streetlights; snow covered roads and Christmas trees. Vail also hosts Family Holidaze, featuring free concerts, ice skating shows, and annual Christmas tree lighting. The ski resort on the Vail Mountain host Snow Daze, the largest mountain bash in North America with live music. And the charm of Vail will compel you to come back year after year. What could be better than spending your Christmas day in one of the greatest German beer halls on a white Christmas? Nothing, right! Hofbräuhaus has a ridiculous selection of beer. After drinking all day, try the Christmas feast of half chicken and pork knuckle followed by strudel. You must also check out the incredible Christmas Markets here. You’ll get a feel for German culture. You must try different kinds of foods, followed by cider or mulled wine to warm you up. You can also buy a gift for your near and dear ones. Please note that due to the unpredictable nature of the weather, these destinations may not receive snow during Christmas. So keep a track of the weather report before you pack your bags for your vacation. Which of these places would you tour for white Christmas? Tell us by commenting below.